Next week we’ll be pitching up at The Palace Picturehouse in Armley Mills Industrial Museum for our final Minicine at The Mills film night of the year. And this month is gonna be so money! Don’t let this trailer fool you, it’s actually a really good film! Swingers is a 1996 comedy-drama about a group of single, unemployed actors living on the ‘eastside’ of Hollywood, California during the 1990s swing revival. Written by Jon Favreau (Elf, Iron Man) and directed by Doug Liman (The Bourne Identity, Mr & Mrs Smith), the movie stars Favreau and Vince Vaughn (The Wedding Crashers, Dodgeball), and also features performances by Ron Livingston (Office Space) and Heather Graham (Boogie Nights). 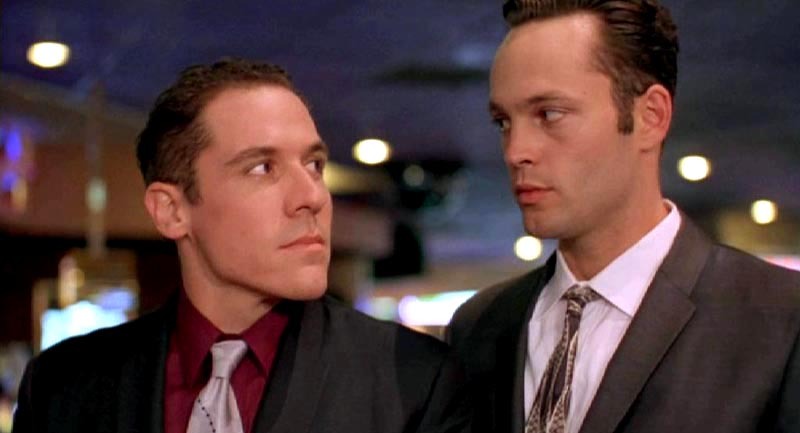 Hip and held in high regard, Swingers was the quintessential sleeper-hit upon its release; seemingly coming from nowhere, the film quickly entered the American people’s consciousness and many of its cast and crew have gone on to bigger and better things (Vince Vaughn’s next film would be Spielberg’s The Lost World: Jurassic Park). The film created greater interest in the swing revival of the time and introduced the mainstream to a whole new lexicon, with “Vegas, Baby! Vegas!” and “You’re so money!” commonly heard on the street. The band The Big Bad Voodoo Daddies, who feature in one of the films pivotal scenes, would go on to perform at the Superbowl half-time show the following year. Liman’s direction and Favreau’s writing give a strong representation of the American independent cinema of the mid-90s, defined by the work of Quentin Tarantino and Kevin Smith. This is a movie about movies, with many scenes and shots lifted from other films, not without reason, and features several conversations about the day-to-day and the trivial as a means of building character. With a wicked personality and a catchy soundtrack, Swingers is a lot of fun and easily relatable. A great film to end our Mills programme on, we hope you’ll join us on Thursday 27th November at 7PM where we’ll continue to bring the funny with a selection of comedic shorts and there’ll be baked goods aplenty, courtesy of the wonderful folk at Noisette Bakehouse. Tickets are currently available from our online ticket office.